The Union for Affordable Cancer Treatment (UACT) welcomes the news that a Russian court has approved a compulsory license for patents held by Celgene for the cancer drug lenalidomide, marketed in many countries under the trade name Revlimid. Compulsory licenses on patents can promote health and protect the interests of cancer patients when there is excessive pricing and other abuses of a legal monopoly. Since entering the market, Revlimid has generated more than $46 billion in sales for Celgene, including $2.3 billion in the first three months of 2018. In the United States, Celgene still claims the drug is protected by 26 patented inventions and the company has also been cited by the Federal Trade Commision for anti-competitive actions to block entry by generic suppliers. UACT and its members are hoping many other countries will follow suit and make this drug available at a better price for the many patients who need it today. In the United States, the executive branch and members of Congress are considering legislation to mandate or authorize negotiations for drug prices in the U.S. Medicare program. As UACT has previously stated, having robust authority to grant a compulsory license on drug practices and other exclusive rights are necessary to ensure that patient access is protected in such negotiations. Revlimid is used to treat patients of all ages, many of whom would not be insured by Medicare in the US. This case highlights why proposals for a national compulsory licensing authority should not be limited to a single government program or a subset of the population. 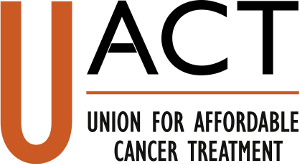 Concerned that the prices of essential cancer drugs are continuing to increase, UACT and its members support the use of existing mechanisms such as compulsory licensing to provide more access to more patients.